Two weeks ago, JMU lost to Elon at home and faced the very real possibility of falling out of the CAA title race before it really began. A quick home win over Towson and a perfect 2-0 road trip through the Northern reaches of the CAA have changed things though. 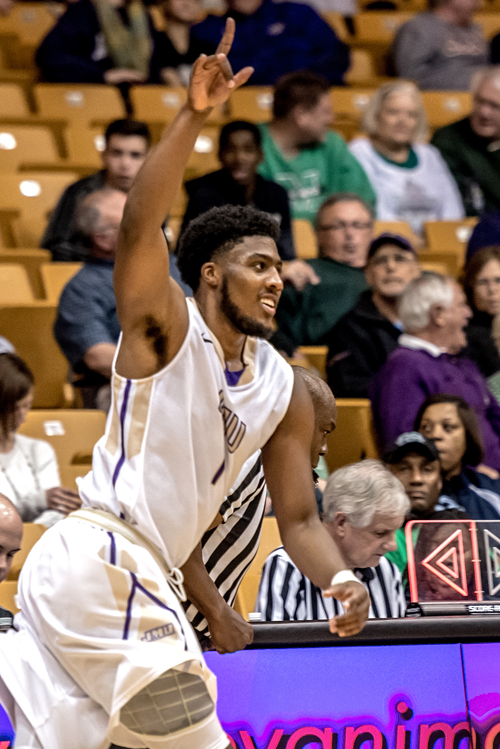 The Dukes knocked of Hofstra 86-82 in overtime Saturday afternoon. The victory got JMU to 4-2 in CAA play. The Dutchmen Pride also sits at 4-2 after the loss. Shakir Brown led JMU with 22 points and 11 boards. YoYo also had a double-double with 16 points and 16 boards. Their teammates Jackson Kent, and Ron Curry also reached double figures in scoring. Here are a few quick thoughts on the win. That’s how many teams are now tied for first place in the CAA. That’s right. Through six games, six of the league’s ten teams find themselves at 4-2. Last year JMU finished in a four way tie for first place. That was nothing. This is chaos, a very fun kind of chaos. JMU, Hofstra, Northeastern, William & Mary, UNCW, and Towson can all legitimately say they’re in first place. And each of those teams has a realistic shot of cutting down the nets in Baltimore. The big difference between last year and this year for the Dukes, is that JMU has already managed to beat fellow contenders. Last season, JMU didn’t win a single game against any of the teams tied at the top. This year they have. The number of losses JMU has on the road this year. The Dukes are a perfect 6-0 overall and 3-0 in the CAA away from the friendly confines of the Convocation Center. That is both an unusual and welcome development. It’s impossible to understate how big last week’s trip through Boston and Long Island was. Stealing one of two would have been good. Winning both was great. Hofstra’s shooting percentage for the game was 36%. At a certain point, we need to to recognize that this is no fluke. These are not Denzel Bowles’ Dukes. Matt Brady actually has this team playing good defense. They’re holding opponents to 39.9% shooting from the field. That’s second best in the CAA (behind Towson) and top 50 in the NCAA. Brady has always insisted that he could coach defense, but explained that success relied on players buying in. Well, he appears to have gotten the guys on this roster to buy in. They’re playing solid defense and great team basketball overall. My favorite number from the weekend was 16. Ya gotta love 16 and 16 from YoYo. I’m enjoying watching this team. I appreciate Brady’s use of the depth. Looking forward to seeing them in person next weekend in Williamsburg.